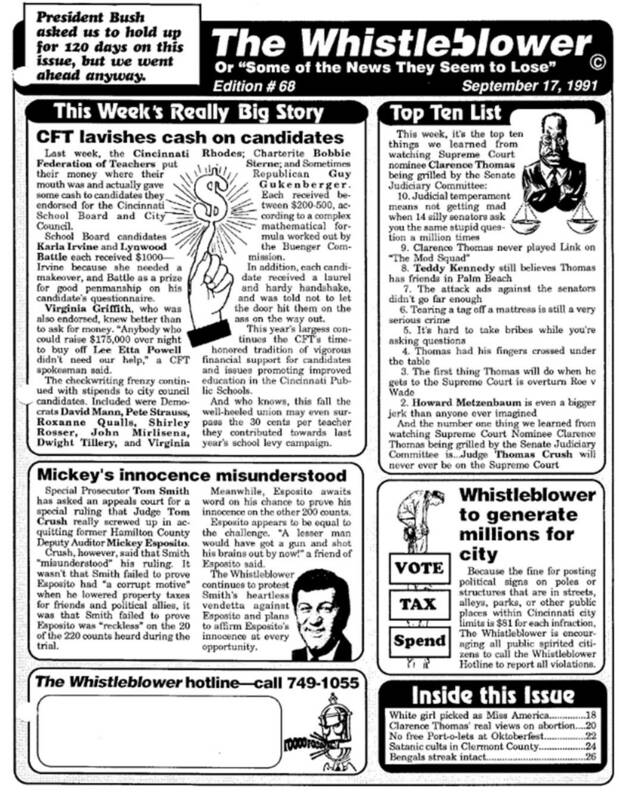 Edition #68 (published on September 17, 1991) of the original printed edition of The Whistleblower (not the Newswire) was delivered to Persons of Consequence all over town. It was our “President Bush asked us to hold up for 120 days on this issue but we went ahead anyway” Issue, and our Really Big Story was all about the money the Cincinnati Federation of Teachers was lavishing on City Council and School Board Candidates. There was a story about how Mickey Esposito’s innocence was “misunderstood.” Our Top Ten List listed the top ten things we learned from watching Supreme Court Nominee Clarence Thomas been grilled by the Senate Judiciary Committee. Plus, The Whistleblower asked people to report illegally posted political signs so the City could make a lot of money fining campaigns $81 for each infraction. 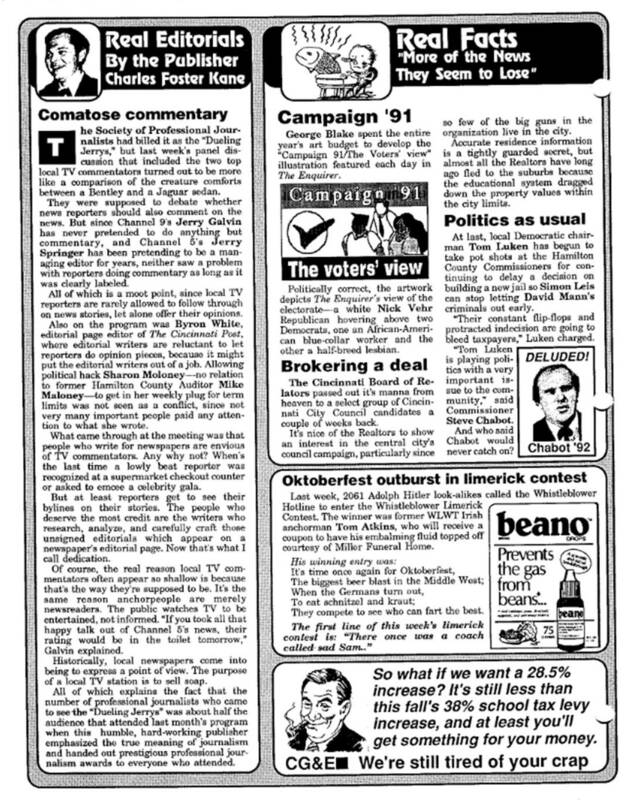 PAGE TWO with a message from the publisher, Charles Foster Kane was doing commentary about whether news reporters should also do commentary. Real Facts told about the Cincinnati Enquirer’s hideous Campaign 91 Artwork, campaign contributions from the Cincinnati Board of Realtors, along with more Politics as Usual. There was an Oktoberfest Outburst in that week’s Whistleblower Limerick Contest, and a bogus CG&E advertisement. 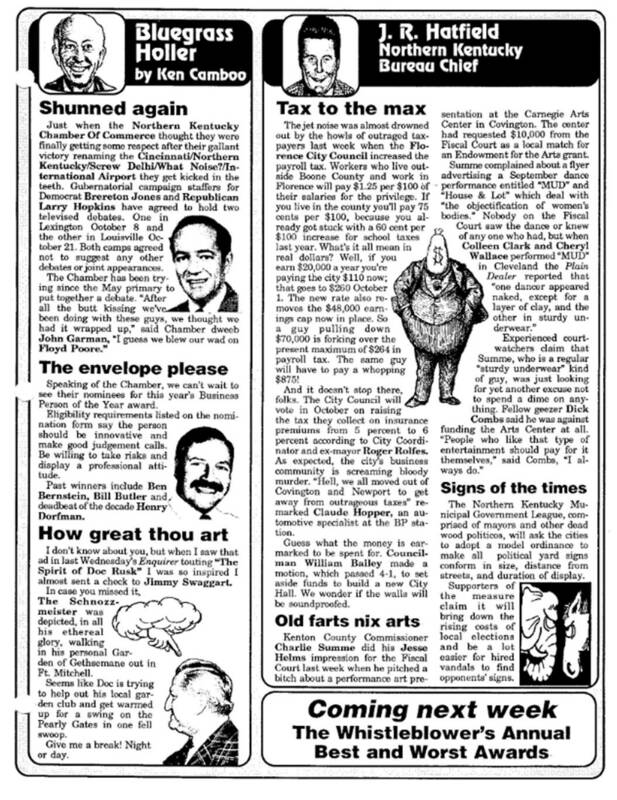 PAGE THREE featured Real Letters from Real Readers from the likes of Father George Cooney, Sheriff Simon Leis, and Jerry Springer. 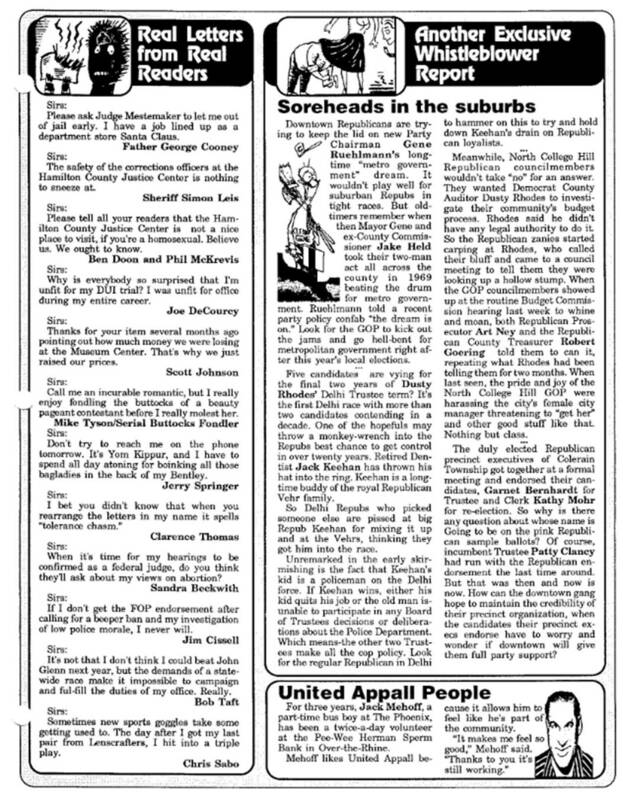 Another Exclusive Whistleblower Report was all about our soreheads in the suburbs, and Jack Mehoff was our United Appall Person. 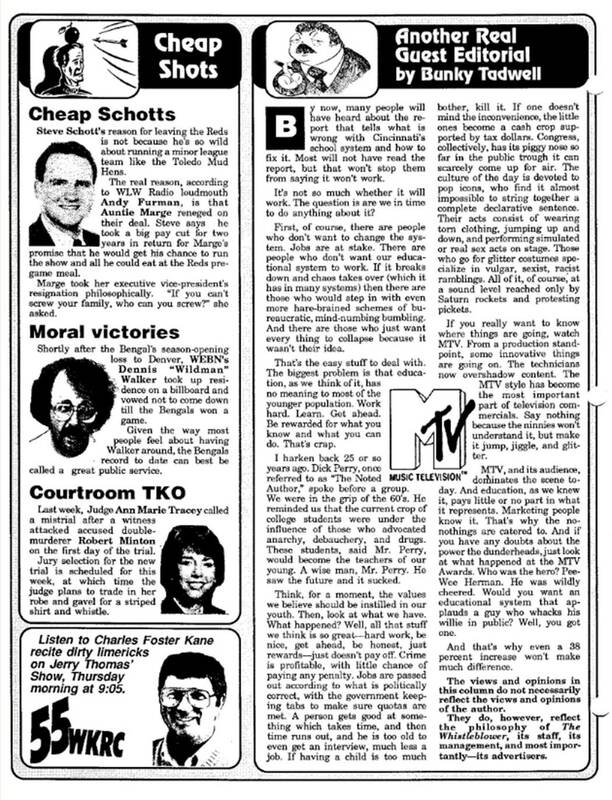 PAGE FOUR’s Cheap Shots targeted Steve Schott, WEBN’s “Dennis “Wildman” Walker, and Judge Ann Marie Tracey. There was also a promo for Whistleblower Publisher Charles Foster Kane’s appearance on a 55 WKRC Radio program. And in Another Real Guest Editorial, Bunky Tadwell devoted his weekly rant to the Cincinnnati Schools. PAGE FIVE featured Bluegrass Holler by Ken Camboo, telling how the Northern Kentucky Chamber of Commerce was being shunned by the both Republican and DemocRAT gubernatorial campaigns. Camboo wondered about the nominees for the Chamber’s Person of the Year. The Camboozler also made jokes about “Doc” Rusk. Northern Kentucky Bureau Chief J. Hatfield told us what happened when the Florence City Council raised the city’s payroll tax. Some old farts were complaining about giving money to support the arts, and the Northern Kentucky Municipal Government League was trying to have the same rules for political signage in all the municipalities in Northern Kentucky. And PAGE SIX included Hotline Hang-Ups (some of the anonymous calls we received last week on the Whistleblower Hot Line. Real Gossip by Linda Libel told us about Jerry Springer, Stan Solomon, Kenny Anderson, and Angelo, the guy from Campbell County Chevrolet. 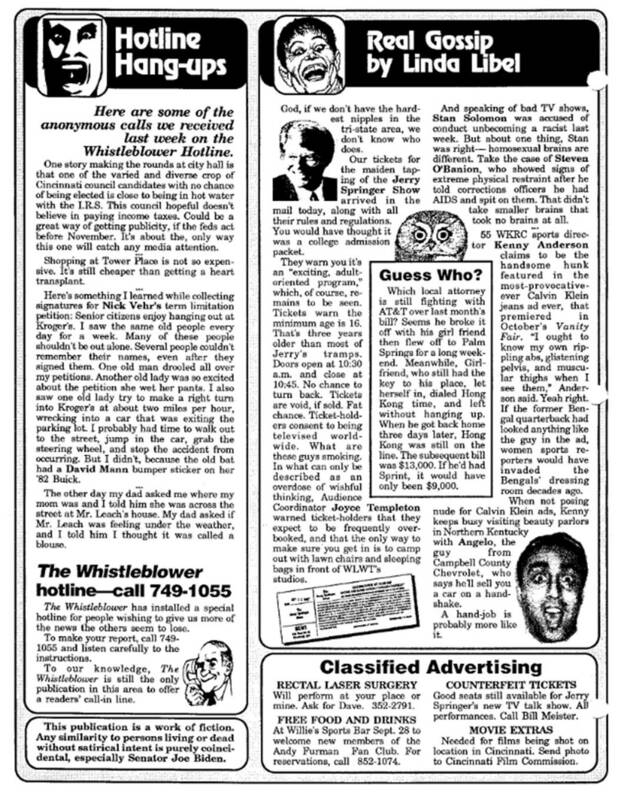 It’s really hard to believe how good The Whistleblower was in those days. You can download that entire edition HERE. This entry was posted in Uncategorized and tagged “Doc” Rusk, and Jerry Springer, and Judge Ann Marie Tracey, Cincinnati Board of Realtors, Cincinnati Federation of Teachers, Father George Cooney, Florence City Council, Kenny Anderson, Mickey Esposito, Northern Kentucky Municipal Government League, Oktoberfest Outburst, Sheriff Simon Leis, Stan Solomon, Steve Schott, WEBN’s “Dennis “Wildman” Walker on September 12, 2018 by charlesfosterkane.